Engineered Components, Inc. - Your One Stop Brake Shop! 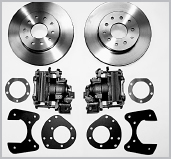 The ECI rear disc brake conversion kit adapts Cadillac Seville/Eldorado rear calipers and 11 inch rear rotors to 8, 8.8 and 9" Ford and GM 10 and 12 bolt GM ('C' clip type), 55-64 Chevy and 8-3/4"/Dana 60 type rear axle assemblies. Calipers utilize the OEM integral parking brake mechanism and standard GM pads. These conversions are the easiest way to upgrade to rear disc brakes with a functional OEM style parking brake. 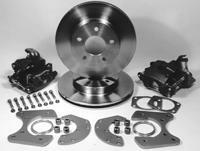 Kits are supplied complete with rebuilt rear caliper assemblies with pads, new 11 inch diameter rotors (11-3/4 in. on EC-843), caliper brackets and mounting hardware. Axle bearing removal is NOT required for installation. 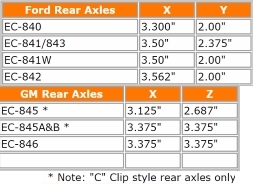 NOTE: ALL 4-1/2 AND 4-3/4 INCH BOLT CIRCLE REAR DISC KITS ARE AVAILIBLE WITH 13 INCH ROTORS - ADD $100.00. NOTE: Minor axle flange machining is required for rotor installation on some Ford and GM installations. Chrysler product rear axles require one piece "GREEN" axle bearings. Ford - Same as above kit for large housing and flange. Ford - Same as above kit for "new style" housing ends.